Remember, most pure spouse of the blessed Virgin Mary, my amiable protector St. Joseph, that it is unheard of that any one ever had recourse to thy protection, and implored thy help, without receiving consolation. Full of this confidence in thy power, I come before thee and recommend myself to thee with fervour. Ah! despise not my prayer, O dear foster-father of our Redeemer, but graciously hear and obtain my request. Amen. The devotion which our Holy Mother the Church desires us to pay to St. Joseph, is, after the homage rendered to Jesus Christ and His Blessed Mother, of all devotions the most just, solid, and reasonable. The influence of this Saint is immense;… that of all the blessed inhabitants of Heaven, none can be found who has so much power with God, save one only exception, his Immaculate Spouse, the ever Blessed Virgin Mother of God. Reason, religion, the authority of our Holy Mother the Church, the testimony of the Saints, and the example of so many holy souls in all ages, since the Incarnation of our Blessed Redeemer, prove, beyond any doubt, the immense influence which the beloved foster-father of Jesus enjoys in heaven. The Eternal Father confided to the care of St. Joseph the two most precious treasures which he possessed on earth; viz., Jesus and Mary. What a sublime honour for St. Joseph! What confidence Almighty God must have placed in him! What influence this unheard of privilege must give him over the heart of God! When a king confides to one of his favourites all that is dearest to him on earth, he certainly bestows an immense honour upon him, and naturally feels disposed to grant this privileged being any favours he may desire for himself or his friends—should he act otherwise, he would be condemned as being insensible to the services rendered to his majesty by his favourite. How much more reasonably, then, may we not expect that in heaven, where our most legitimate affections receive an immense increase of perfection, the slightest desire of this great Patriarch is immediately granted, seeing that he enjoys such power and influence with the Eternal King. The Church teaches us that the Immaculate Mary has immense power and influence with God; and, therefore, desires all her children to honour her in an especial manner. St. Bernard calls Mary “an all powerful supplicant,” (“omnipotentia supplex.”) If, then, Mary honoured and respected St. Joseph while on earth, as her lord and spouse, whom the Eternal Father had placed over her, humbling herself to render him the most menial services, if St. Joseph was thus honoured by Mary while on earth, is it not most reasonable to expect that, although his influence be not so great as the Queen of Angels, he should, at least, be honoured next to her; and be placed side by side in heaven above all the other saints? Moreover, we know that while on earth the Son of God obeyed St. Joseph; that He honoured him as His father; and served him with His own divine hands. And think you that in heaven St. Joseph has not, so to speak, retained, in the same manner, the influence which he then had over the heart of the Infant God?—and that he could not draw from that ocean of goodness treasures of grace more abundantly than any other saint? To think otherwise is impossible. In fine, St. Joseph saved the Adorable Son of Mary from the murder of the Innocents, by flying with Him into Egypt; he shared with the Blessed Virgin the cares, love and tenderness with which she watched over His helpless infancy; he laboured day and night to support, clothe, and nourish the Holy Family; and think you that all these services (if [one] may dare to employ such a word when speaking of the Creator) could be forgotten by our Blessed Lord? The thought would be blasphemy. The prayers of St. Joseph are orders for this God, who rewards even a cup of cold water given in His name! The Church also in her turn, adds her testimony to the great power which St. Joseph possesses in heaven. 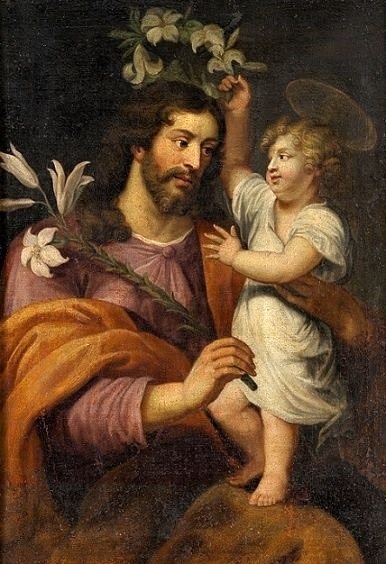 That church, to which Our Blessed Lord has given a charge to teach us all truth, and to lead us into the path of true piety, enjoins us to be devout to St. Joseph; and does all in her power to excite in us a tender devotion towards him. She has raised numberless magnificent sanctuaries in his honour, and has instituted two solemn festivals, which are kept throughout the Catholic world; so that from east to west, from north to south—in a word, wherever the mysteries of the adopted Son are celebrated, the glory of the foster-father is always duly honoured. The Church proposes St. Joseph to her children as the model of an interior life, and the patron of a happy death. She would have them consecrate the Wednesday of each week to honour him, and has granted indulgences on his feasts, and to the pious practices performed in his honour. Taken from: A novena to St. Joseph, to obtain of God, through the intercession of this holy Patriarch, 1871. Imprimatur. Oh, St. Joseph, whose protection is so great, so strong, so prompt before the throne of God, I place in you all my interest and desires. Oh, St. Joseph, do assist me by your powerful intercession, and obtain for me from your divine Son all spiritual blessings, through Jesus Christ, our Lord. So that, having engaged here below your heavenly power, I may offer my thanksgiving and homage to the most loving of Fathers. Oh, St. Joseph, I never weary contemplating you, and Jesus asleep in your arms; I dare not approach while He reposes near your heart. Press Him in my name and kiss His fine head for me and ask Him to return the kiss when I draw my dying breath. St. Joseph, Patron of departing souls - Pray for me. March 2: FIRST FRIDAY/The Holy Winding Sheet of our Lord (Friday after the II Sunday of Lent). March 4: III Sunday of Lent, Double of the I Class; Commemoration of St. Casimir, Prince of Poland, Confessor; Commemoration of St. Lucius I Pope and Martyr. March 6: Ss. Perpetua and Felicity Martyrs, Double. March 7: St. Thomas Aquinas Confessor and Doctor of the Church, Double. March 8: St. John of God Confessor, Double. March 9: St. Frances of Rome Widow, Double; The Five Holy Wounds (Friday after the III Sunday of Lent). March 10: The Forty Holy Martyrs, Simple. March 11: IV Sunday of Lent, Double of the I Class. March 12: St. Gregory I Pope, Confessor, and Doctor of the Church, Double. March 16: The Precious Blood (Friday after the IV Sunday of Lent). March 17: St. Patrick Bishop and Confessor, Double. March 18: I Sunday of the Passion (Passion Sunday), Double of the I Class; Commemoration of St. Cyril Bishop of Jerusalem, Confessor, and Doctor of the Church. March 19: St. Joseph, Spouse of the Blessed Virgin Mary, Confessor, and Patron of the Universal Church, Double of the I Class. March 21: St. Benedict Abbot, Greater Double. March 23: Seven Sorrows of the Blessed Virgin Mary, Greater Double; Commemoration of the Feria. March 24: St. Gabriel the Archangel, Greater Double. March 25: II Sunday of the Passion (Sunday in Palms), Double of the I Class. March 26: Monday in the Holy Week (Jesus curses the fig tree). March 27: Tuesday in the Holy Week (Cleansing of the temple). March 28: Wednesday in the Holy Week (Judas Iscariot plans his treachery). March 31: Holy Saturday (A day of Fasting & COMPLETE Abstinence). Holy Passion of our Lord Jesus Christ, save us.